Outhaul line jammed on mystery bolt through boom...? Re: Outhaul line jammed on mystery bolt through boom...? Check OD of shaft on the pin side and compare with thread side. If thread side is smaller then maybe there's a shoulder on pin side and so remove by hitting on thread side with nut unwound to be level with end of bolt. One vote for compression tube frozen to bolt. 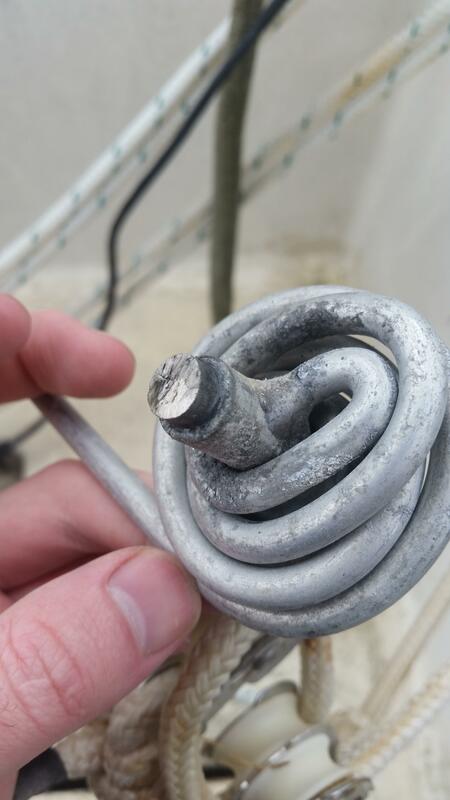 Also try boiling water down bolt shaft. Galvanic residue is soluble. Thanks for all the advice! From the comments I was pretty sure this was just some kind of dysfunctional pulley mount that needed to come out. I went to the boat and sprayed penetrating oil on the bolt and gave it a few more whacks. I put a wrench on it and turned till the rod hit resistance...then I turned it some more! Aluminum fused to stainless steel...this is becoming a theme for me lately! So I guess this looks like some kind of compression tube....that was used with the long rod attached to it by someone with skinny arms up to their shoulder in the boom to position the pulley so that it could be captured by the bolt....creating the fixed block portion of the pulley system?! Wow, that's some seriously ductile rod! It is pretty hard to tell from the photos, but the line running through those blocks looks kinda big for the block size. This might have been part of the high friction in your outhaul. 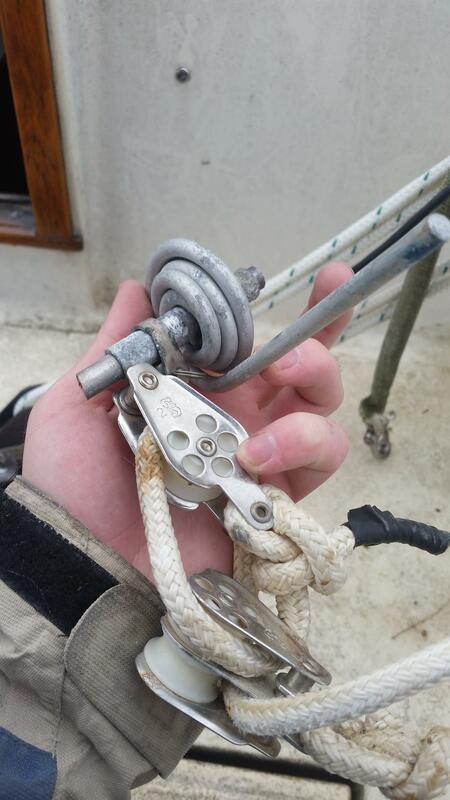 If you are refitting the system, substituting smaller dyneema line will aid in free running both under load and when slack. That has to be the weirdest thing I have ever seen inside a boom. The pin itself is just a mounting the block, the rest I am guessing was used during installation to get the block into the right place for the pin to go through. Personally I wouldn't even attempt to recreate that disaster. I am not sure how much purchase you are planning on, but I would probably go higher than the 4:1 that's there. Reinstallation is going to be a bit tricky but isn't to bad. 1) get a piece of stainless rod the same size as the holes in the boom, and a little longer than the boom is wide. Drill a hole thru the rod on either end such that the holes are about 1/8" further apart than the boom is wide. This is going to be your new hard point. 2) run the bite of a doubled up line from the gooseneck down the boom out the back. A wire fish helps a lot here if you have one handy, but just a weight can work. 4) attach the rest of the outhaul system and be prepared to insert it all into the boom. 5) using the doubled up line pull the block to the holes and then using a small piece of wire, screw drivers, or other tools to orient the shackle just above the boom, and slot the rod into place. 6) finally instal the second ring, and have a beer. Getting that rod to slot into place deserves at least one maybe two. 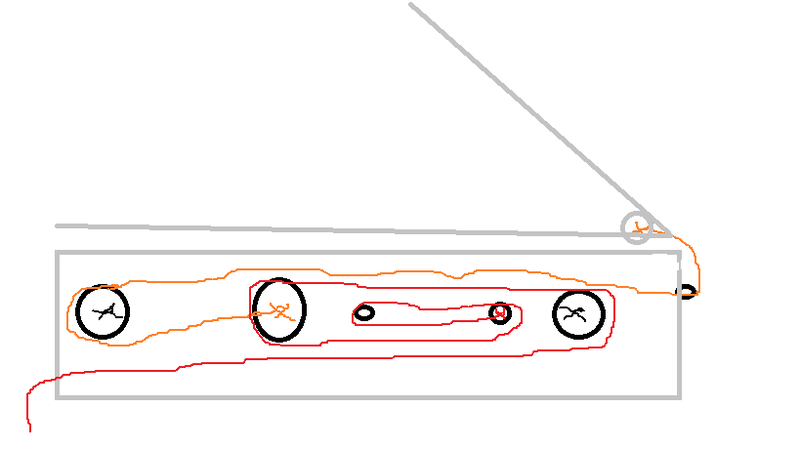 Alternatively splice a piece of spectra to somewhere near the gooseneck and attach the block to the spectra. It's a lot easier. Yea I think I'll be replacing these blocks that come out. I was looking at the page here: Harken . Does that look like a pretty good representation of my available options? Which pully system would you pick? I'm leaning toward the 5 to 1 option...fiddle blocks seems like theyd be less likely to get twisted and fouled maybe? Yep, you're on the right track, regarding building your system. And you've little to worry about, re; twists in your purchase setup, when using non-fiddle blocks. +1 on what Jim Cate said. Also, yeah, it’s also worth switching to some low friction blocks, like a set of Harkens. That way, it’s easy to adjust the outhaul, even when the main’s loaded up. On a boat this size, I'd suggest a 6:1, or better, an 8:1 system. Preferably via a 3:1 or 4:1, with an Internal Cascade. Harken has some good Outhaul System Designs, with diagrams. In order to rig it: Affix a piece of line inside of the boom, up near the gooseneck, to secure your Internal Cascade Block to. And size it, length wise, so that the block’s far enough forward inside of the boom, to allow for a sufficient range of adjustment of things. Then, for line, for the Outhaul proper; use Dyneema for everything except the bit which you actually pull on by hand. Which you can accomplish either by stripping a piece of Dyneema cored double braid, or adding a cover onto the tail end of a purely Dyneema line. Also, use a diameter of line that's a size (or more) below the max. which the blocks will accept. And finish the end off with a big stopper knot, or plastic twing ball, on the line’s bitter end. To make it easy to grip, when you really need to pull on it with some force. Option B, for rigging it: Would be to use that cross bolt as a 180 point, for a line to position your Internal Cascade Block. And again, locate it so that the block’s far enough forward inside of the boom, to allow for a sufficient ranges of adjustment. And you can easily terminate the line’s bitter end, just inside of the boom’s aft end. To a purpose mounted strap eye, some other fitting, or even to the boom’s end cap, if there’s room. Then, the rest is as above, in "Plan A". I would probably go with the 5:1 internal (I also far prefer fiddle blocks) but instead of it terminating there would add a 2:1 cascade for a total purchase of 10:1. Alternatively I would use a 3:1 then two 2:1 cascades to get to 12:1. Once you get away from that stupid pin swapping them out won't take much time. My outhaul for instance can be stripped out and checked in about 10 minutes. The longest part of which is trying to remember where I put the stupid washers when I set them down. As uncivilized suggested use very small dyneema for the working line (1/8 or 3/16 probably) and only the last cascade should be sized to actually handle. The smaller the line the easier it runs and the smaller the amount of friction. With modern high tech lines there is no need to go to larger stuff, it's also much cheaper. I like the 10 to one cascade fiddle idea. I drew a mock up in MS paint, haha. I think there might be a better way to route the lines though. My version requires both blocks with black X's on them to be in fixed position (the colored X's are just line termination points). Is there a way to rig it so that only one block needs to be in fixed position?